Santa Claus, the Easter Bunny and things that go bump in the night. There are many “acceptable” lies that some parents tell their children. The 3 biggies are: Santa, The Easter Bunny, and the Tooth Fairy. I honestly never gave these things much thought, except the Easter Bunny… As a Christian, I always had trouble making the leap from Christ’s resurrection to a giant egg- leaving rabbit, but that’s not my point today. It seems that many parents in America don’t have a problem telling their kids that a big fat man, a giant bunny, and a fairy, will sneak into their homes, in the dark of night, and leave surprises. 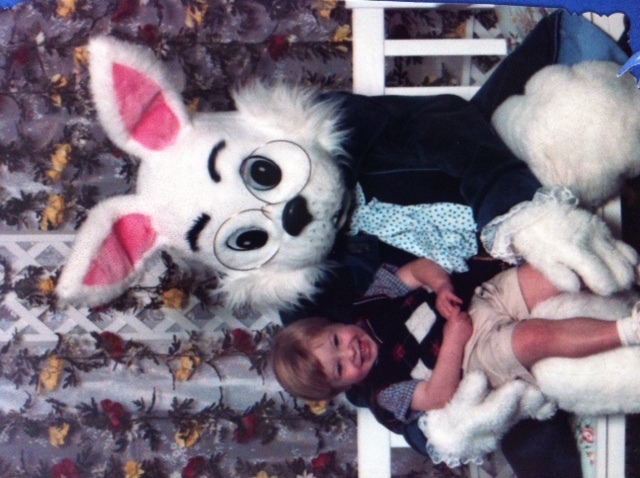 Some parents even drag their kids to the mall, stand in line, and put them on a strange person’s lap for a picture…. When I put it that way, it sounds kinda creepy, doesn’t it? I’ve had parents tell me that it’s fun! It’s tradition! It’s harmless and kids love it. Seriously? I used to leave reindeer snacks, cookies, and carrots out for our annual intruders. I never even really minded that my kids didn’t have to thank me for their gifts cause they were from Santa, and he wasn’t there on Christmas morning. If you are a parent that has had your kids write thank you letters to Santa – kudos! I tried… but then forgot, and my kids didn’t remind me. Those dang kids. It all changed one day back in 1997, when my darling daughter had just turned 5. My second child told her that all of these American icons, where not real. She came to me, and asked if it was true. I sat down and confirmed what her stinker brother had said. She looked right at me, with big blue, tear filled eyes, and said, “Mommy, why did you lie to me?” Really. My heart broke. I told her all of those great reasons, and she said, “but mommy, it’s not fun. it always scared me”. After that, we had a family meeting and we found out that all of our kids found it a little scary, and they never really understood the connections… Santa/Birth of Christ, Bunny/Christ resurrection or Teeth/Fairies… At the time, I was expecting my fourth child and the kids informed me that, if we planned on “lying” to the baby, they would not participate. That was the end of the mystical characters in our home.